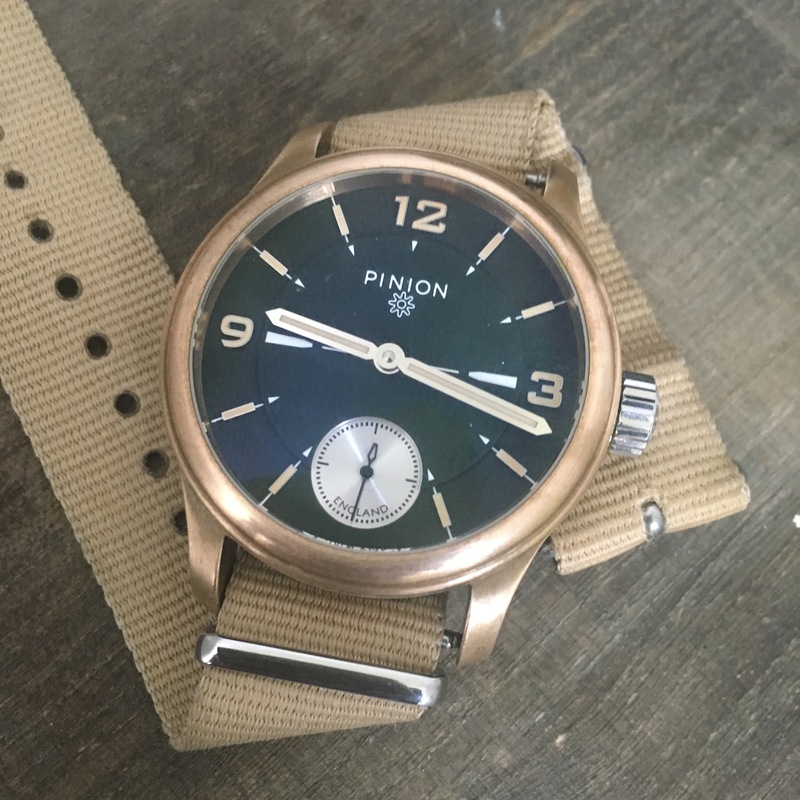 If you have been reading some of my previous posts or maybe seen my Instagram stream, you will know I have a Bronze Pinion Axis Pure LE for which I been giving updates on the development of the famous “bronze patina”. Anyway slowly slowly the case of my watch has been getting darker and I have been quiet pleased with the result. 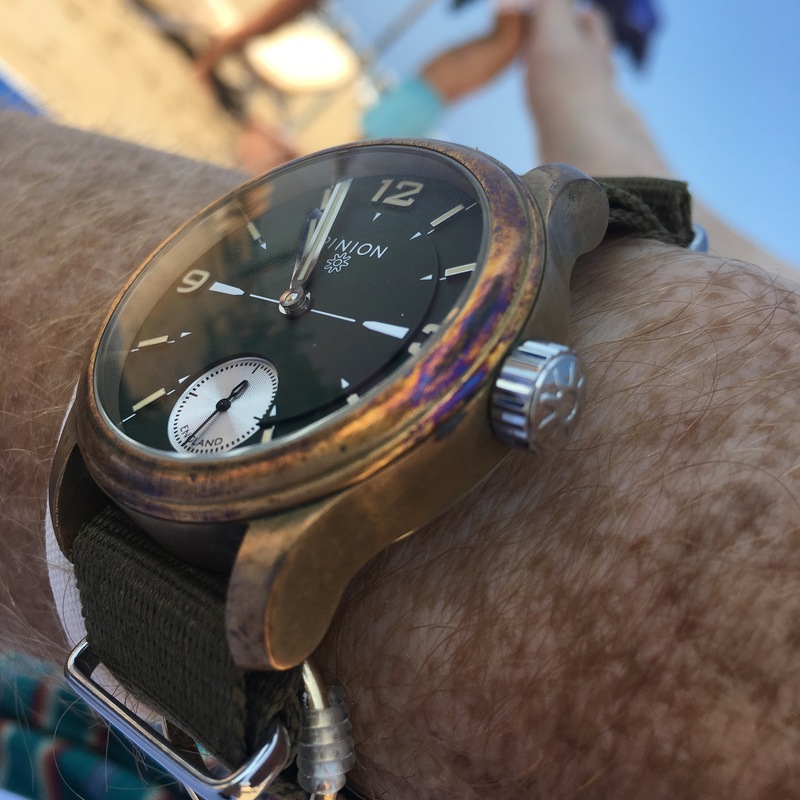 Having read about and seen the drastic effect contact with sea water can have with bronze , some examples I have seen such as some bronze Panerais or the Oris diver of which have gone pretty extreme. I was interested and slightly concerned how my watch would react to my two weeks in Sicily. Before I show you the effects of seawater I must say the Axis Pure with a couple of Nato straps works out as a pretty good holiday watch. It is water resistant to at least 100m which avoids worrying about swimming. It is tough and any knocks it might take can only enhance its “lived in” look. Finally you don’t have that worry of it attracting the undesirable attention, some more famous Swiss brands get, from street criminals. With the bronze version you get the added interest of how the case will react to different environments like the chlorine of the swimming pool to salt water of the sea. The conclusion is chlorine seems to have the effect of slightly brightening the metal whilst the sea is the most fun. The photos above and below where taken after the watch had been in the sea for an hour. 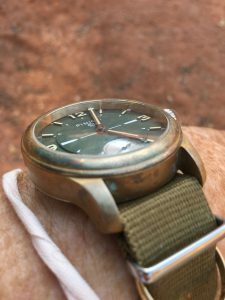 My first thoughts were “wow, that looks pretty cool” quickly moved on to “will that come off?” Now I was pretty confident there are ways to bring the watch back to its original finish but I did not want to return to the “as new look` – fortunately with a bit of a rub you can bring the watch back to whatever level of patina you like. My next experiment will be to leave the watch a little longer before taking it back to normal.